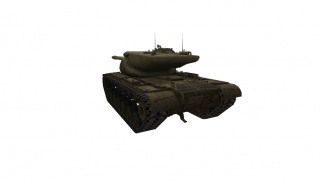 The T57 Heavy Tank is an American tier 10 heavy tank. Proyecto de un carro pesado con torreta oscilatoria y cargador automático desarrollado desde 1951. Se fabricaron torretas experimentales para cañones de 120 y 155 mm en 1957. Sin embargo, se consideró que el proyecto no tuvo éxito y se abandonó el desarrollo. 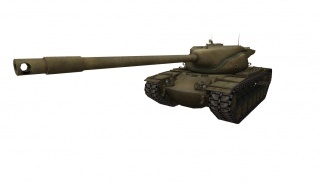 The T57 Heavy Tank is a tier X heavy tank in the American tech tree. Unlike the T110E5, the T57 is armed with a 4 round auto loader. Apart from that and the slow aim time, the T57's gun is nearly the same as the T110E5's one. Its armor isn't as good as that of the T110E5, but it can bounce shots if angled correctly. The reload on this tank is really outstanding, only needing about 22 seconds to load the magazine and about a 2 second delay between shots, giving the gun amazing burst and DPM potential. Use the quick clip reload to your advantage and help your team deal massive damage to the enemy and this tank will be a force to be reckoned with. The T57 Heavy Tank marks the end of its American heavy line. Highest DPM of all tier 10 heavy tanks and one of the highest in general. Gun depression is surprisingly good for a tank with an oscillating turret. Decent accuracy when fully aimed (Same as AMX 50 B's). Armor is an amusing joke. Lower plate is very flat in one's perspective (only less than 130mm effective). Module damage: ammo rack can be damaged through lower glacis; turret ring is very exposed and frequently gets jammed/damaged. Very vulnerable to artillery thanks to very poor overall mobility, will often guarantee a ticket to the garage. Crew swapping from its predecessors is questionable, takes large amount of time to get used to this machine. With all the right crew skills, modules and consumables, your T57 will reload the clip in about 22 seconds, which is quite impressive. The time to load between the 4 rounds held in the clip is a mere 2 seconds. The armor, while it is not stellar, is still capable and will bounce if you angle well - something that this tank seems to do a good job of. This tank has somewhat acceptable gun depression, being better than most autoloaders. This tank is an offensive powerhouse, if somewhat fragile. When supporting a tougher tank in close-quarters combat, the opportunity to unload 1600 burst damage for free into distracted tanks can be devastating. 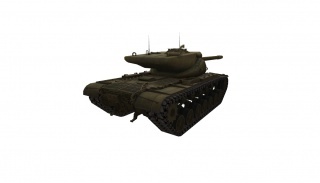 The T57 is less effective on its own, because it can be rushed while on reload. However, if you can dictate range or corner fighting, you can trade 3- or 4-for-1. While it's not quite as good as unreturned damage, it's still quite good. If you can preserve your HP into the lategame, the T57 is one of the best finishers in the game - clipping down half-health or multiple one-shot tanks in return for only a fraction of your health can swing a tight match in your favor. Having BIA and vents is recommended, as it not only shortens the painfully long aim time and clip reload time (although the 25sec magazine reload speed is still blisteringly fast when compared to its french counterpart) it also increases the accuracy of the gun (0.34 with BIA/vents separately, 0.32 with both BIA and vents, 0.31 with BIA and vents and cola), helping to make every shot count. In an autoloader making your shots count is critical so if you have the chance to fit your tank and crew with the mentioned augmentations then take it. All told, the T57 is one of the best and most flexible damage-dealers in the game. If you manage to get yourself into the right positions in the battle, react appropriately and most importantly survive and don't attract too much attention, it is not unusual to dish out 5000, 6000 or more damage in a game. The T57 was a heavy tank developed in the U.S. in the mid-50's, It was a slightly modified version of the US T43E1 prototype that further evolved into the M103 heavy tank. In October 12, 1951, a decision was made to develop a prototype of a heavy tank with an oscillating turret, a new idea at the time invented by the French AMX company, and adopted on a highly successful AMX 13 light tank, and not so successful AMX 50 series of heavy tanks. 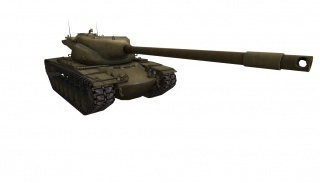 The new American tank, designated T57 (according to the American post-war terminology - "120-mm gun tank T57“), was based on the chassis of the T43 tank (a prototype that further evolved into the M103) with a brand new oscillating turret that hosted a powerful 120 mm T123E1 gun. The oscillating turret design, lacking a conventional gun-mantlet, is in two separate parts, with an upper and lower part connected by two hinge bolts or pivots, the gun being fixed within the upper section. The horizontal movement of the gun, traversing, is conventional, but the vertical movement, elevation, is achieved through the pivoting of the entire upper section with respect to the lower section. This method of elevation has two main advantages. Firstly it allows for a smaller turret volume, as no internal space is needed for the vertical movement of the gun breech. Secondly, it allows the use of a relatively simple auto-loader fed by multiround magazines, achieving a very high rate of fire for as long as the magazines were loaded. The Automatic loader was located in the back of a massive tower, and consisted of the feeder drum with 8 rounds. The drum was loaded by a hydraulic actuator, and the commander or gunner could pick three different types of ammunition. Spent cartridges were ejected through a special hatch on the roof of the turret. Main armament of the tank was 120 mm T123E1 gun with the rifled barrel, and placing such a big, powerful and heavy weapon into the oscillating turret was plagued by various problems. Handling the immense recoil of the gun, and stabilizing the heavy turrets were among the issues that were never completely resolved. The tank had the crew of 4, where the loaders' job was to reload the drum after all rounds had been fired. The tank carried a total of 10 additional rounds in the ammo rack, making a total ammo load to 18 rounds. Other issues were limited gun elevation (due to the back of the turret movement being limited by the hull), problems with ammo protection at certain angles (oscillating turret doesn't have mantlet that solves this problems on classic turrets) and the lack of protection against radiation, chemical or biological weapons, which was considered very important back in the fifties and sixties. The development was very slow and interest in the tank started to fade. Changing priorities in favor of the development of small, aero transportable tanks led to the cancellation of the project in January 1957, before the prototype reached operational status and could be tested. No photos of the assembled prototype T57 with 1200 gun have survived. Esta página fue modificada por última vez el 25 oct 2016, a las 13:17.